The labor sector will be front and center with Friday’s Jobs Report for April. On Tuesday, look for the ISM Services Index, which is a national non-manufacturing index. Employment data kicks off on Wednesday with the ADP National Employment Report, the prelude to the government’s Jobs Report. Also look for Productivity for the first quarter of 2015. On Thursday, Weekly Initial Jobless Claims will be released, as usual. Friday is the big day with the April Jobs Report, which includes Non-farm Payrolls, Hourly Earnings and the Unemployment Rate. 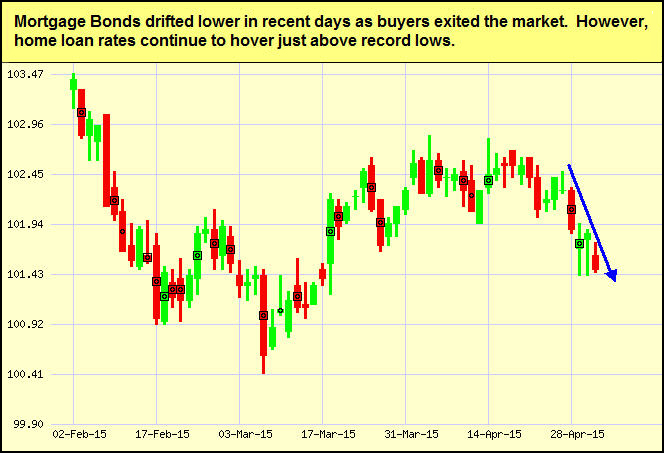 As you can see in the chart below, Mortgage Bonds moved lower in recent days. Home loan rates continue to hover near record lows and I will continue to monitor them closely. If you are planning a vacation this summer, you may wonder if you’ll really be able to unplug. Pack these five tips into your vacation itinerary, and they will help you unplug on your holiday any time of year. Cross-train and delegate. With a little training (and a little patience) people can be cross-trained to support job responsibilities in the office. This broadens everyone’s understanding of what each person does. It also provides a level of sustainability in the event someone has to be out for an extended period of time. Get an intern. Interns are a great resource to offset seasonal swings in business staffing needs. High school and college interns can handle social media, general office duties and more. Be flexible with your work week. For instance, working four 10-hour days can help you enjoy a long weekend getaway. You still have ample time to complete deadlines, but you gain time away, too. Put it in writing, and communicate often. Schedule a vacation on your calendar and let people know well in advance. Make sure your out-of-office email message and voicemail state you are on vacation, when you will be back, and when people can expect a follow up from you. When you set those expectations, allow yourself enough time to manage your callbacks and email responses. Leave the electronics at home. Do yourself a favor and really give yourself time to rejuvenate and unplug. Pack a paperback book, a deck of cards, or a notebook and pen to journal. As always, feel free to pass these helpful tips along to your team, clients and colleagues!